^ a b Lovgren, Stefan (July 6, 2005). ""Guns, Germs and Steel": Jared Diamond on Geography as Power". National Geographic News. Retrieved 2011-11-16. ^ "Smallpox Epidemic Strikes at the Cape". South Africa History Online. 16 March 2011. ^ Cohen, P. (March 21, 1998). "Geography Redux: Where You Live Is What You Are". The New York Times. Retrieved 2008-07-09. ^ Wigen, Einar; Neumann, Iver B. (2018). "Introduction". The Steppe Tradition in International Relations: Russians, Turks and European State Building 4000 BCE–2017 CE. Cambridge University Press. doi:10.1017/9781108355308.003. Retrieved 2019-01-22. ^ Tom Tomlinson (May 1998). 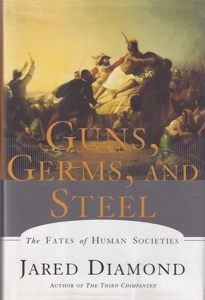 "Review:Guns, Germs and Steel: The Fates of Human Societies". Institute of Historical Research. Retrieved 2008-03-14. ^ a b Andrade, Tonio (2010-01-01). "Beyond Guns, Germs, and Steel: European Expansion and Maritime Asia, 1400-1750". Journal of Early Modern History. 14 (1–2): 165–186. doi:10.1163/138537810X12632734397142. ISSN 1385-3783. ^ James M. Blaut (2000). Eight Eurocentric Historians (August 10, 2000 ed.). The Guilford Press. p. 228. ISBN 978-1-57230-591-5. Retrieved 2008-08-05. ^ Hayes-Bohanan, Pamela (2010). Birx, H. James, ed. 42: Prehistoric Cultures. 21st Century Anthropology: A Reference Handbook. 1. pp. 409–418. ISBN 9781452266305 – via Gale Virtual Reference Library. ^ Johnson, Matt (April 9, 2009). "My "top ten" books every student of International Relations should read". Foreign Policy. Archived from the original on 2014-12-25. Retrieved 2016-01-02. (Registration required (help)). ^ Drezner, Daniel W. "The top ten books to read about international economic history". Foreign Policy. Retrieved 2019-01-22.